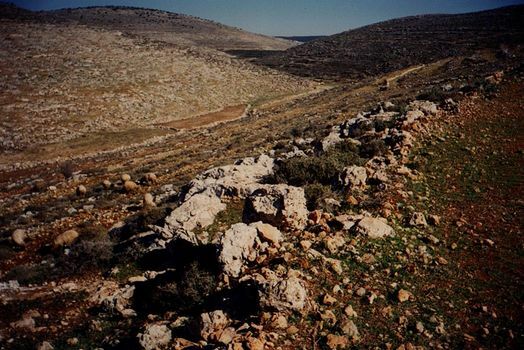 We move south of Jerusalem now, to the highlands known historically as the Judean Plateau. (That's not a name you'll want to use in conversation with Palestinians.) At its best, it's a difficult environment for agriculture. A land of "milk and honey"? This "field" is planted to wheat, which may or may not produce a crop worth harvesting. Much of the land sloping east and west from the plateau south of Jerusalem looks this grim, so when Palestinians and Israelis lay claim "to every inch" of the West Bank, this is what they're fighting over. Of course they'd disagree and perhaps say, arguing by analogy, that fighting for a flag is not the same as fighting for a piece of cloth. 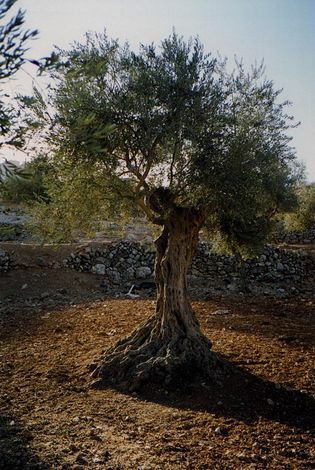 The emblematic crop of the West Bank is the olive, but it doesn't grow well south of Jerusalem, partly because the climate is too dry on the eastern slope and because the plateau is too frosty for the frost-intolerant olive. As if this wasn't hard enough on the poor olive, many olive trees have been pollarded to within an inch of their lives. 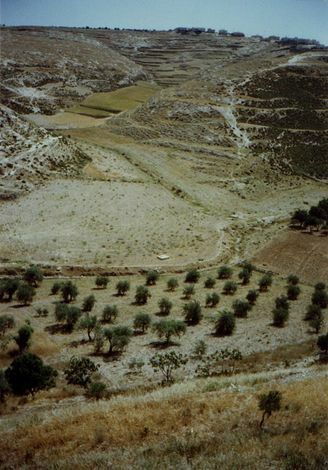 Southeast of Bethlehem and on the slope down toward the Dead Sea, the land quickly dries, but olives are still planted in this valley that catches some runoff. There is terraced wheat upstream, but the crop yield is low at best. Much of the land is good only for grazing by sheep and goats. 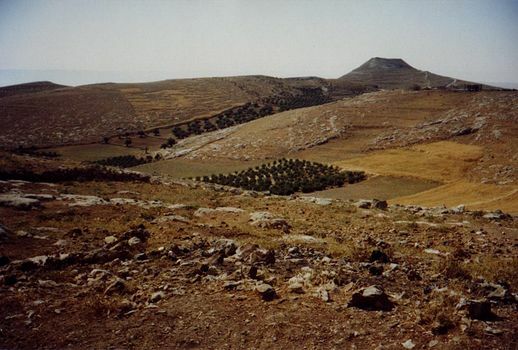 A similar landscape, marked in the background by the mysterious summit of Herodion, where Herod built a palace. 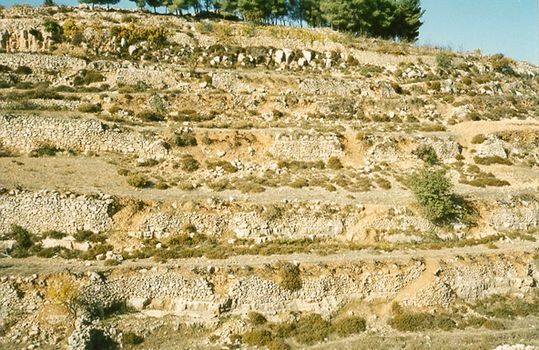 Add to the hazards of drought the political problems of farming on the West Bank, and you have to expect sad sights like this: collapsing terraces near the bypass road around Hebron. Panning to the left. There's a lot of heartbreak in this picture. 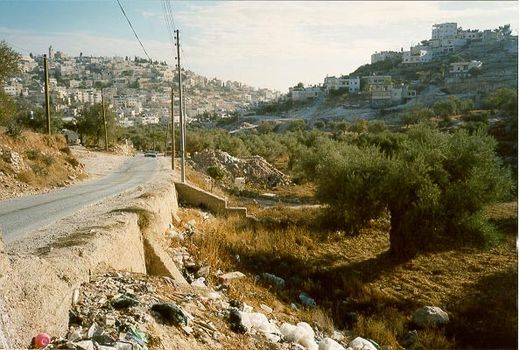 Bethlehem used to be surrounded by olive groves, but urban expansion, Israeli controls, and neglect have decimated them. Here, on the south side of the city, some trees are still cared for. Barely saw him before the camera flash. 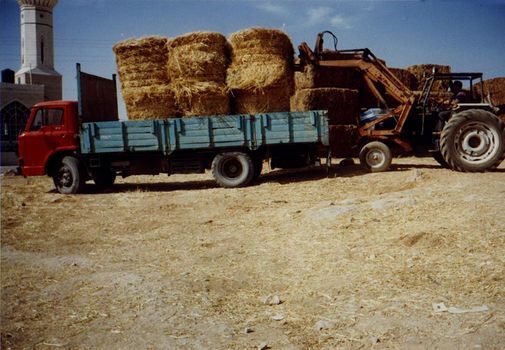 Much of the eastern desert across which Palestinians try to graze sheep and goats lies now in closed military areas, as livestock owners have to buy fodder--in this case round bales imported from Israel. Such grain as in grown in the south is either harvested by hand, in work crews drawn from local villages, or by small harvesters like this one, made in Italy. The prized crop of the southern highlands is the vine, grown in many ways but here unsupported by trellises or even stakes. 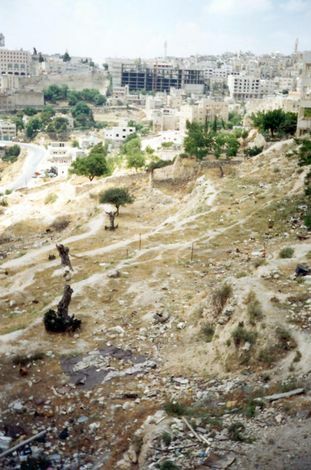 The pines in the background are near Arrub, where, adjoining a large refugee camp, there is a pool once linked by underground tunnel to Solomon's Pools and Jerusalem. 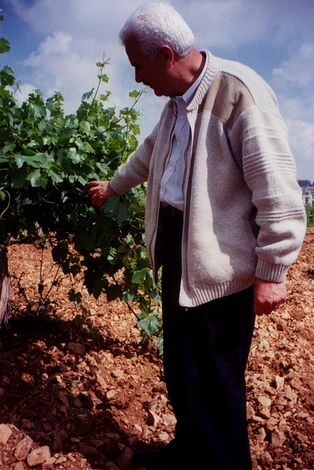 A more intensive kind of grape production: vines supported by trellises and forming a network casting heavy shade. 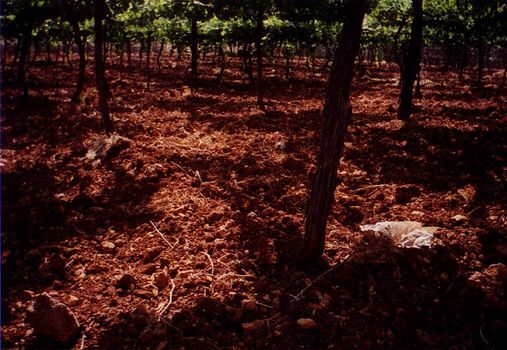 Yields are much higher than with the unsupported vines shown in the previous picture. A proud owner. 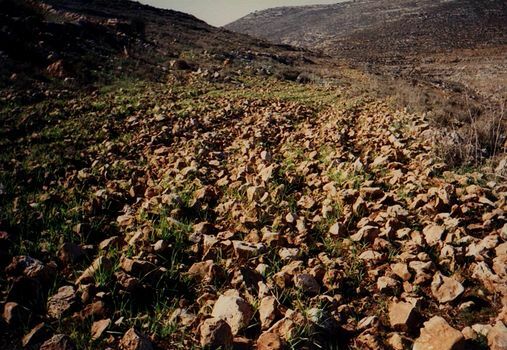 The soil is unbelievably rocky, but that is characteristic of the whole area south of Jerusalem. 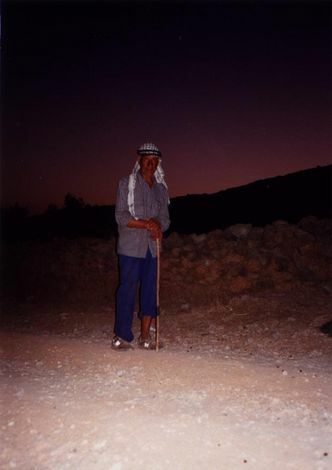 The previous picture was taken in Halhul, north of Hebron. So was this one, showing greenhouse tomatoes. 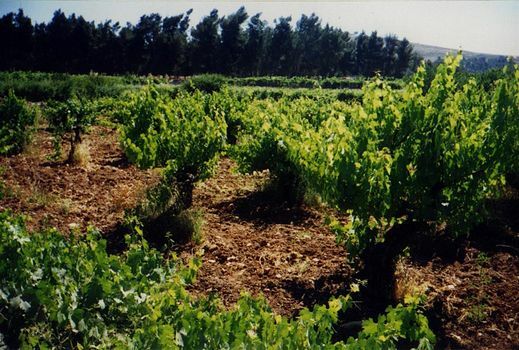 The competition comes from the Jordan Valley, warm enough for outdoor production in winter. 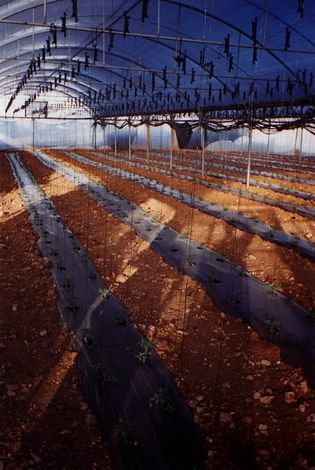 Here the crop relies on irrigation from a cistern collecting the rain caught on the greenhouse's own roof. 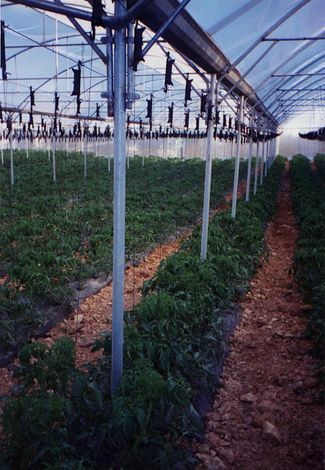 The greenhouse was made in Israel. A close-up of the guttering mechanism that captures the rainwater. A field of grain at the village of Wadi Fukin. 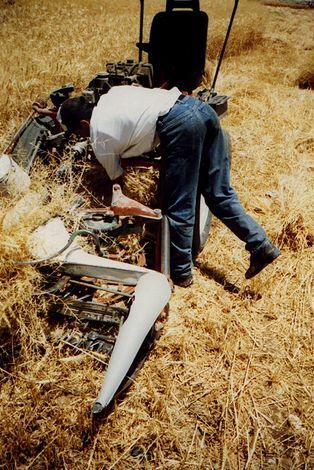 The field should be seen less as an agricultural undertaking than as a land-holding tactic. The fast-growing Israeli settlement of Betar Illit lies just to the east. 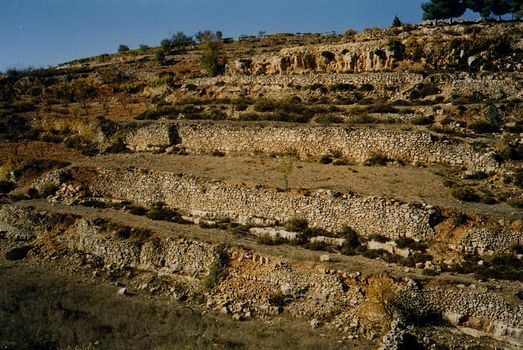 On the other side of Betar Illit is Nahalin, where bare rock has been blasted into terraces for fruit trees. Passersby are welcome to take a plum: the owner says that in so doing they are "eating for the soul of my father." 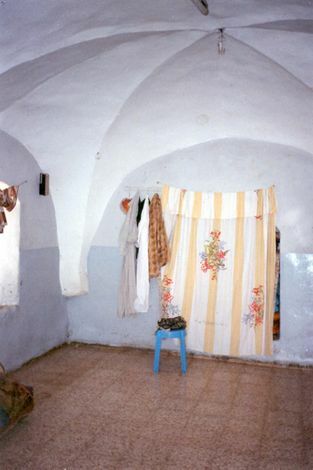 Here, near Herodion, is the kind of home occupied by families from generation to generation on the West Bank. It contains the architectural germ or basic cellular unit that was expanded to form all the larger indigenous buildings of the West Bank. 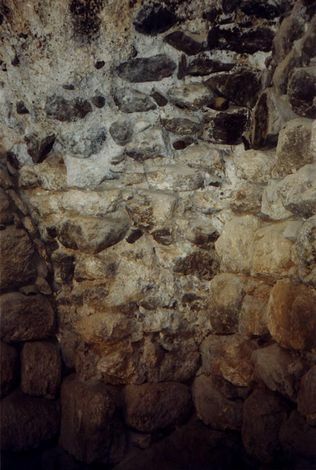 The massive walls are comprised of inner and outer walls of finished stone separated by a thermal layer of rubble. The roof is domed. 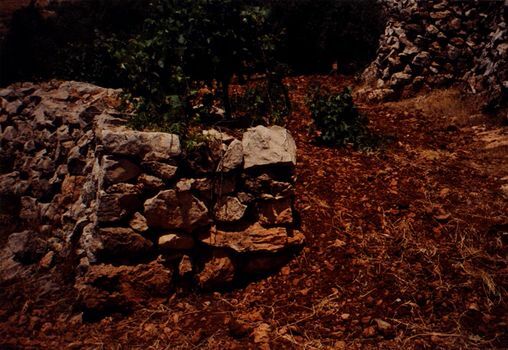 The stone was probably quarried from the hole that become the family cistern. The same house, showing the pendentive supporting the dome. 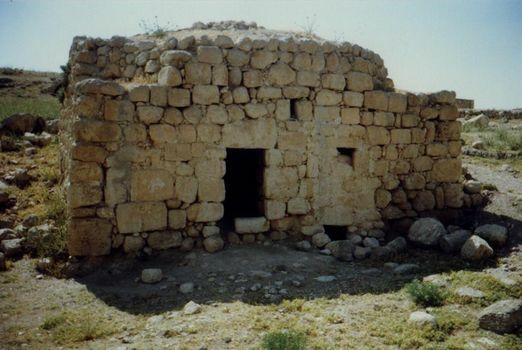 A typical home of the sort built on the West Bank today for families of average means. 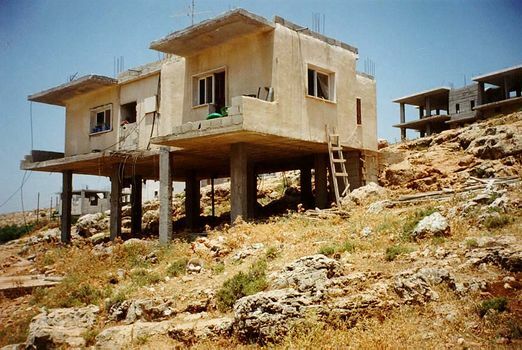 The house is not finished, because the owner lost his permit to work in Israel, but it's inhabited by him, his wife, and their four children. Nearby, there is an older home with a basement bedroom. All the bedding is folded up and stashed behind the curtain. 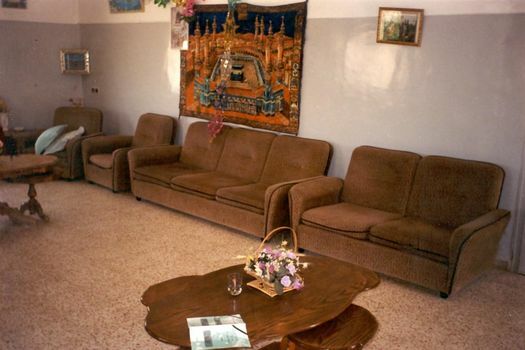 Upstairs, there's a modern, flat-roofed addition with this "best room" and an image of Mecca. 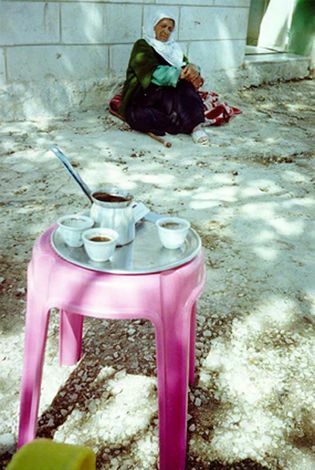 It's hard to walk around the West Bank without being asked to have coffee, which easily leads to bread and oil made from wheat and olives grown on the spot. In this case, a teenager was the inviter; his mother brought the coffee and made the bread in her own outdoor oven fired with sheep dung. Her mother-in-law cast a skeptical but silent eye.